Vogelzangweg 2, 6325 Valkenburg, Nierderlande. Just a few minutes from Maastricht, Valkenburg and Thermae 2000 you will find the family hotel Kasteel Geulzicht for guests who enjoy the peace of the countryside. This castle-hotel**** has an elevator and ten beautiful guestrooms (28-51 m2). 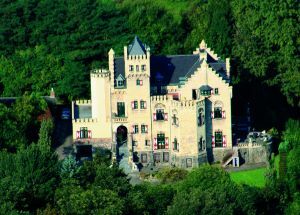 Hotel Geulzicht Castle is open to hotel guests only, and this, combined with its spectacular surroundings, ensures an atmosphere of privacy and quiet that you will not find at many other places. 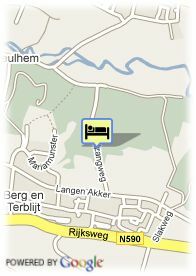 Contrary to most hotel castles, the guests of Geulzicht Castle stay and sleep in the original castle itself! Wald, Bahnhofsnähe, Fluss, auf dem Land, Panoramische Aussicht. Weniger als 7 Tage und mehr als 3 Tag(e) vor Anreise: 2 Nächte zu zahlen. Wenn man die Reservierung nicht benutzt und keine Annulierung macht: Die ersten 3 Nächte sollen gezahlt worden. ältere Kinder und Erwachsene: 50.00 € pro zusätzliches Bett. Babybett: 14.00 € pro zusätzliches Bett. Visa, Diners Club, Maestro, Mastercard, Pinpas. The outdoor café and à la Carte-restaurant is for staying guests only. If dinner is booked in advance together with the reservation, the price for a three-course à la Carte dinner will be 27.00 EUR per person. The South Limburg area is known as the centre of the Euregio. Berg en Terblijt is centrally situated in this area. The Ardennes, the Eifel, Aachen and Liege are, so to speak, within a stone’s throw. But the central location of Geulzicht Castle proves particularly ideal in relation to Valkenburg (3 km) and Maastricht (6 km). A scenic foothpath bordering the river Geul takes you through the nature reserve Ingendael to Valkenburg, the city of marl. Here you can enjoy at length the cosy atmosphere of the sidewalk cafés, relax and indulge at Thermae 2000, or have a go at the brand-new Holland Casino on top of the famous Cauberg. Maastricht is known by many for the famous Treaty of Maastricht, which made the unification of the present Europe irreversible.